NASA's farthest-flung solar-powered robotic probe, Juno, has finally crossed over into Jupiter territory, where the gravitational attraction of the gas giant planet is stronger than the sun's. Juno is now on the threshold of a mission that promises to solve many long-standing mysteries about our solar system's largest planet. 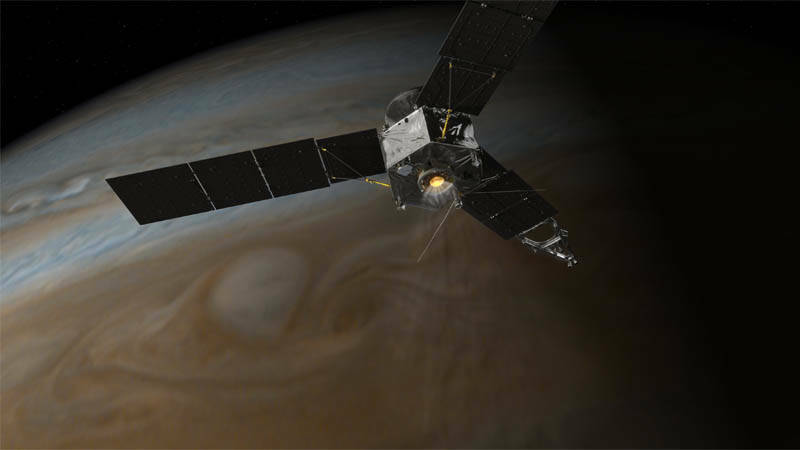 On July 4, Juno will become only the second spacecraft to enter orbit around Jupiter, over twenty years after the end of the successful Galileo mission. Equipped to observe not only the outward appearance and composition of Jupiter, Juno's payload of instrumentation will allow scientists to probe deep beneath the planet's surface and hopefully solve long standing puzzles about Jupiter's structure, interior conditions and even its origin. Jupiter may be the largest planet, and the closest of the gas giant worlds in the outer solar system, but that does not mean its secrets have all been revealed to us. Most of Jupiter lies hidden beneath a veil of cloud, a shroud that ordinary cameras cannot see beyond. Past robotic missions and telescopic observations have told us a great deal about Jupiter's cloud-banded outer face, its composition of mostly hydrogen and helium, and its powerful magnetic field — strongest of any planet — that exerts influences well beyond the realm of its more than 67 moons. Jupiter's moons as well — in particular the four large "Galilean" moons discovered by Galileo over 400 years ago — have been revealed as remarkably interesting and diverse worlds of their own. One of them, Io, is the most volcanically active object in the solar system, with nearly 400 active volcanoes spewing plumes of sulfur and sulfur dioxide. Another, Europa, likely hides an ocean of liquid water beneath its icy crust, perhaps as deep as 30 miles and containing more water than all of Earth's oceans — making Europa one of the most exciting possibilities for finding some form of life. But Juno's primary mission is to investigate Jupiter itself — and not just its cloud-painted outward face, but the deep dark depths of its interior. What lies inside Jupiter? Being a gas giant planet, it is believed that Jupiter is all or mostly atmosphere — or more accurately, fluid: a thick shell of ever-denser hydrogen and helium that the unimaginable pressures deep down force to behave in ways we don't think of as "gas-like." At some depth, hydrogen should be compressed to the point where it would become "metallic," or electrically conductive like a metal, though still fluid — maybe not unlike the liquid metal mercury, which is used in some thermometers. It is thought that Jupiter's powerful magnetic field is generated by electrical currents within these metallic hydrogen layers. There is plenty of other "inside information" about Jupiter that scientists want to get their hands on. Finding out how much water Jupiter contains may help determine where and how Jupiter originated long ago. Did it form where we find it today — about five times as far from the sun as Earth — or, as a competing theory suggests, did it form farther from the sun and migrate to its present location? Jupiter's internal water content would be an indication of the environment that produced it, so Juno may help settle this long standing question. 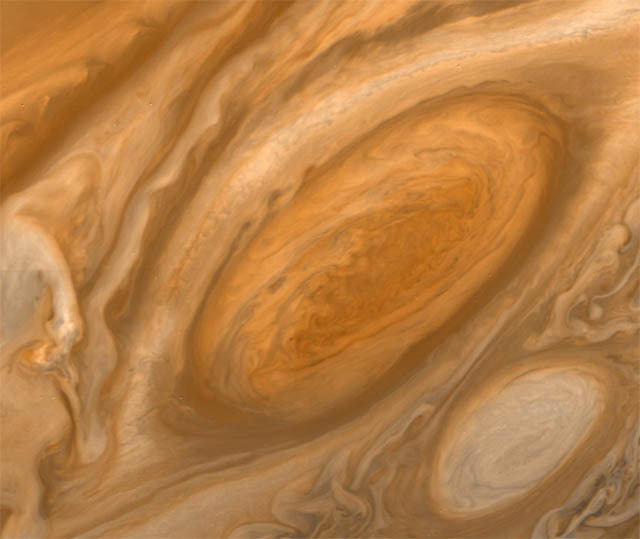 What is the source of the great storm systems we see on Jupiter, including the famous "Great Red Spot," a gargantuan anticyclone that has been swirling just south of Jupiter's equator for at least 300 years? How deep do the influences that generate and sustain these storms go? That's an easy question to answer on Earth, where the roots of weather systems don't go much deeper than Earth's solid and watery surface. But on a planet where the atmosphere may extend many tens of thousands of miles, this is an open question. 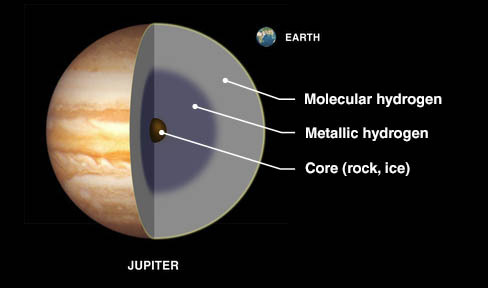 And what lies at Jupiter's core? Is there a rocky or metallic core down there under all the hydrogen and helium? Has carbon been compressed over time into diamond crystals that have settled to Jupiter's center, as some have suggested might be possible? Juno will orbit Jupiter in a "polar" orbit, circling the planet in a north-south orientation that will carry it repeatedly over Jupiter's geographic and magnetic polar regions. 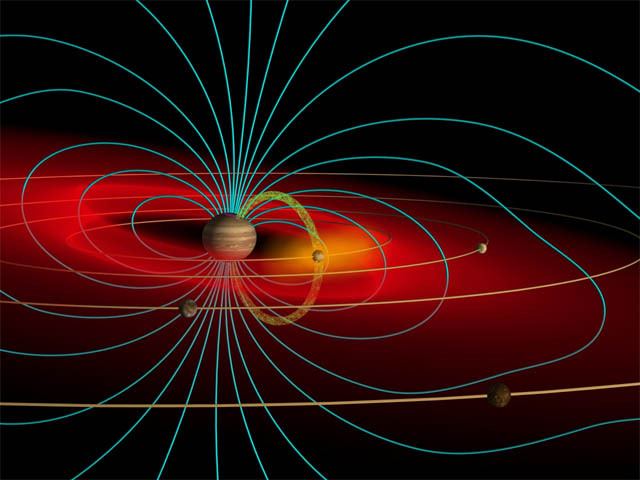 Juno will make detailed measurements of the powerful magnetic fields that extend into space from within Jupiter, as well as detect tiny fluctuations in Jupiter's gravitational field authored by internal structures (a little like reading Jupiter's interior in Braille). While conventional cameras and telescopes cannot see beneath Jupiter's cloud tops, just as your eyes cannot see through a thick window curtain, the magnetic energy and gravitational variations originating in the interior carry information that we can use to probe those depths. Juno will, in effect, probe beyond the planet's surface appearance and give us a glimpse of what lies inside….